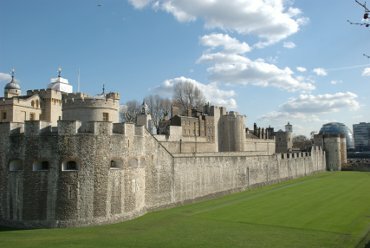 The the north-west corner of the Tower of London - the view you would see when approaching from the Underground at Tower Hill Station or Tower Gateway Station. You can just see two of the towers on the White Tower on the left edge of the picture on the skyline. One of London's well known landmarks the White Tower was started in the early 1080s by William the Conqueror and various monarchs have added to the fortifications since. It is open to the public and is often included in the 2for1 offers and we wouldn't even consider going in without that offer because of the exhorbitant entry fees. 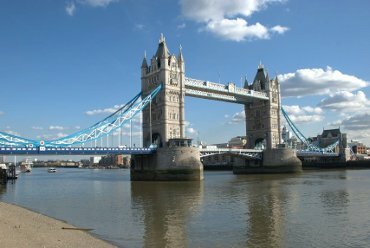 A short distance from the Tower of London is another well known landmark - Tower Bridge. It is not, as some people call it, London Bridge. London Bridge is the next bridge upstream and is very boring by comparison. If you pay the entrance fee you get to walk across the upper level walkway. St. Catherine's Dock used to be one of London's trading docks but has now been converted to a housing area including some shops and restaurants. This show the Dickens Inn, on the left, which is not a 'real' inn but an old 18th century warehouse which has been converted, in the style of an 18th century three storey balconied inn, to a pub and restaurant. 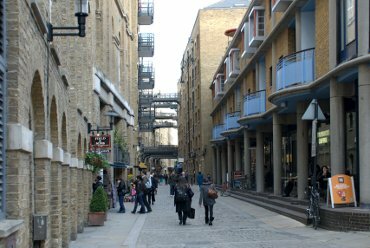 This street is Shad Thames and is just across the south side of Tower Bridge. 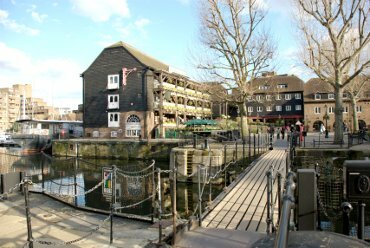 It was once a series of wharves but has now been converted to shops, restaurants and housing. The upper level bridges are used as balconies by the residents. 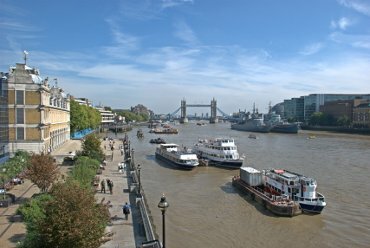 Part of the Thames Path, on the north side of the Thames, showing the old Billingsgate Fish Market on the left, Tower Bridge in the distance and HMS Belfast moored on the far side of the river.